Navy Type PZT Classifications | Sensor Technology Ltd. Navy Type PZT Classifications | Sensor Technology Ltd. The Navy Type PZT classifications defined in MIL-STD-1376B have been the standard for lead zirconate titanate materials for several decades. This article examines what is and what is not specified in the standard. Additionally, it briefly discusses variations in comparable materials from different manufacturers and their implications when switching vendors or adding an alternate piezoelectric ceramic supplier. The Navy Type PZT classifications defined in MIL-STD-1376B are broad. As a result, the performance characteristics of “equivalent” materials from different suppliers will vary. Additionally, manufacturers provide nominal PZT performance data with fairly broad tolerances. So, performance variances should be expected not just vendor-to-vendor, but also from piece-to-piece and batch-to-batch for the same vendor. To find a reasonable replacement material don’t try to find one that matches all the performance characteristics of what you’re currently using. Instead, focus on just those performance characteristics critical to your application. Ignoring those characteristics that are less important to your application often makes it possible to switch suppliers or add a secondary vendor to your supply chain. In practice, finding an alternate supplier for Navy Type PZT is feasible for most applications. The piezoelectric phenomenon was discovered by Pierre and Jacques Curie in 1880. It generated significant interest in the scientific community but found no practical application for more than three decades. With the birth of undersea warfare, which began with the German Uboat in World War I, the first industrial use for piezoelectric materials was developed. In 1917 a team led by French physicist Paul Langevin paired a piezoelectric transmitter with a piezoelectric receiver to create the first submarine detection system. This development laid the cornerstone for modern sonar. The technology saw continued development in the decades that followed World War I. The next significant breakthrough came with the introduction of Barium Titanate and Lead Zirconate Titanate in the 1940s and 1950s. The performance of these piezoelectric ceramics was much better than any naturally occurring piezoelectric crystals. Additionally, their chemistry could be modified to tailor performance for a specific application, such as high power transmission or high sensitivity receiving. The U.S. Navy spearheaded the characterization and classification of these materials given their importance in undersea warfare systems. This work led to the standards for Navy Type PZT which were documented in MIL-STD-1376B. The 1376B standard was ultimately cancelled in 1999. 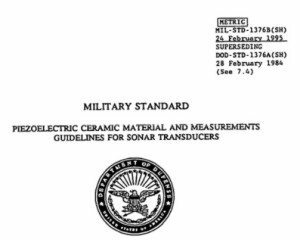 While the Navy Types were originally created as guidelines specifically for sonar transducer design, they survive today as the defacto industry standard. They are used by most manufacturers to classify their PZT materials and they are referenced by scientists and engineers working in a broad range of industries, not just in sonar transducer development. MIL-STD-1376B can be downloaded directly from the Defense Logistics Agency (DLA). Note that because of its poor piezoelectric performance, Barium Titanate has been all but superseded by the PZT materials. It is available from a small number of manufacturers to support legacy products. The 1376B standard does not define the specific chemical composition of lead zirconate titanate (PZT). Instead, the standard focuses on defining the performance characteristics of the materials. A piezoelectric ceramic qualifies as a Navy Type PZT not because of its exact chemical composition but because of its physical and electrical properties. The standard defines each of the Navy Types with fewer than 10 characteristics. Manufacturers generally list several additional characteristics. These may be of interest for some design applications but they are not in fact part of the standard. In addition to establishing performance criteria, 1376B defines a standard test specimen as well as test conditions to ensure repeatability of the characterization process. Naturally, the outcomes from repeated testing will show some variation so, for most characteristics, the standard defines a center value with a symmetrical tolerance. These tolerances range from +/- 3% to as much as +/- 15%. Some of the characteristics are not defined by an acceptable tolerance range but simply by a minimum or maximum allowable value. MIL-STD-1376B also provides recommendations for acceptable quantities and dimensions of chips, cracks and pits. These suggested acquisition practices are provided for those working in a purchasing/acquisition role. The MIL-STD-1376B standard outlines only small number of performance characteristics and defines them with relatively large tolerances. Navy Type ceramics can, and do, vary widely. The published nominal performance values of “equivalent” Navy Type materials from different manufacturers tend to show significant differences. As a result, a Navy Type PZT from any one manufacturer is not necessarily a drop-in replacement for the same Navy Type from another manufacturer. That said, switching suppliers or finding additional vendors to add redundancy to your supply chain is not impossible. Focusing on matching only those PZT performance characteristics that are the most important to your application will allow you to find a practical substitution for most applications. Most vendors will meet a performance target and tolerance that you specify. Table 1 below compares characteristics of BM402 from Sensor Technology Ltd. and PZT402 from Morgan Advanced Materials. (Tables are not displayed on small screens.) Both materials are Navy Type I PZT. While the two are reasonably similar, they show some differences from each other, as well as from the nominal values specified in the standard. They provide a clear illustration of how materials meeting the same Navy Type specification can vary. In fact, Morgan produces five piezoelectric ceramics that are all different but that all meet the Navy Type I standard. Table 1 also compares BM402 with Channel 5400 (also known as Channelite-5400), both Navy Type I materials. As expected, the two materials are not identical. Interestingly, BM402 was formulated specifically to serve as a Channelite-5400 alternative. It will function as a drop-in replacement for most applications but, given the differences between the two materials, it will not work in all cases. From a practical perspective, start with the approach described above: to evaluate one material as an alternative for another, focus on just those properties that are critical to your system design. This will help you identify potential PZT suppliers. Note, however, that this is only the first step. Vendors publish nominal data with tolerances as high as ± 20%. So, those properties considered in the initial evaluation are subject to variances. Additionally, those properties not evaluated may have an important impact on your application. So, after comparing nominal values to identify potential sources, the next step is to contact suppliers. For very specific performance characteristics be sure to discuss the target values you require and the tolerances you are willing to accept. Table 2: BM500 from Sensor Technology Ltd. is a Channel 5500 alternative. Both materials conform to the Navy Type II (PZT-5) standard. As explained above, the differences between the two are typical. Morgan Advanced Ceramics produces six Navy Type II ceramics. One is shown in table 2 above. In theory, some of these materials may provide a unique performance ideal for a specific application. However, with standard tolerances of ± 20% there is a significant overlap in the performance of these six materials. The practical way to achieve a specific performance from PZT is to talk to your vendor. Table 3: SensorTech’s BM800 and four different PZT-8 variants from Morgan (only one shown) all function as reasonable Channel 5804 alternatives. All six Navy Type III materials show typical differences in their published performance values. Table 4: Channel 5600 and BM527 are both Navy Type V materials. This unique composition is a balance of types II and VI. It is not commonly used because most applications are better served by the specific performance of either type II or type VI, not the compromise of type V.
Table 5: BM532 is a Channel 5700 alternative. Both materials are Navy Type VI PZT.